Dundee held Celtic to a goalless draw in a tumultuous Dens Park clash, with the league leaders moving five points clear of second-placed Aberdeen. Both teams struck the woodwork, with Stefan Johansen and Rory Loy hitting the same post either side of half-time. The visitors had two second-half headers cleared off the line, while Scott Bain denied Leigh Griffiths twice amid a fine defensive display. Dundee remain sixth in the table, level with Partick Thistle who sit seventh. This was only the second time in 23 matches that the defending champions had failed to score in a game and Dundee can take pride from the fact both were against them. Dundee successfully frustrated them in a 0-0 draw at Celtic Park last month and the tactics Paul Hartley employed that night certainly did a similar job in the first half here. Griffiths was largely isolated up front as the home defence starved the Premiership's top scorer of supply from wingers Partick Roberts and Gary Mackay-Steven. Roberts did trick his way into space on seven minutes but blazed his shot over the bar while Scott Bain got out quickly to block from Griffiths when he did break free. At the other end Celtic's main moments of anxiety once again came when defending set pieces and Nick Ross nearly capitalised only for Craig Gordon to parry his shot. The goalkeeper needed Dedryck Boyata to tidy things up on that occasion but the Scotland international made a clean save to prevent Loy converting a Kane Hemmings flick-on. Celtic did start to exert a more sustained period of pressure on Dundee goal near the interval but Gary Mackay-Steven slashed a chance well wide of the target. Then two minutes from the interval Johansen's shot took a wicked deflection as it looped its way beyond Bain but the ball bounced to safety off the keeper's left hand post. Celtic enjoyed Barcelona levels of possession in that first half but the statistics show they actually had fewer shots on target than the home side during the first 45 minutes. 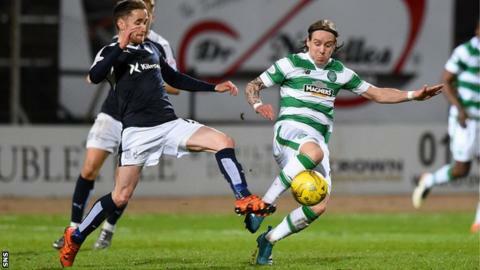 Craig Wighton replaced Dundee's top scorer Hemmings at the interval and the winger, who tormented Celtic in last month's draw, nearly scored with his first run. It took a crucial save by Gordon to deny the youngster. The change certainly didn't have a negative effect on Dundee and they were only the width of the post away from taking the lead on 57 minutes as they pinned Celtic back for a spell. Paul McGowan once again brought out the best in Gordon with a shot from 20 yards and Loy could only turn the loose ball against the frame of the goal from close range. That sparked a positive response from Deila's side and successive corners from Roberts around the hour mark saw first Mikael Lustig then substitute Charlie Mulgrew see headers cleared off the line. It was end-to-end stuff in a frantic finale as both sides chased a win but Dundee denied Celtic a clear-cut chance while always looking a threat on the counterattack. Match ends, Dundee 0, Celtic 0. Second Half ends, Dundee 0, Celtic 0. Corner, Dundee. Conceded by Charlie Mulgrew. Substitution, Celtic. Stuart Armstrong replaces Gary Mackay-Steven. Corner, Celtic. Conceded by Kevin Holt. Attempt missed. Nir Bitton (Celtic) right footed shot from the centre of the box is too high. Patrick Roberts (Celtic) wins a free kick in the attacking half. Corner, Celtic. Conceded by Julen Etxabeguren Leanizbarrutia. Thomas Konrad (Dundee) wins a free kick in the defensive half. Attempt missed. Scott Brown (Celtic) right footed shot from the centre of the box is just a bit too high. Attempt missed. Colin Kazim-Richards (Celtic) header from the centre of the box misses to the right. Gary Mackay-Steven (Celtic) wins a free kick on the right wing. Attempt blocked. Leigh Griffiths (Celtic) right footed shot from the centre of the box is blocked. Attempt saved. Nir Bitton (Celtic) right footed shot from outside the box is saved in the bottom right corner. Substitution, Celtic. Colin Kazim-Richards replaces Mikael Lustig. Corner, Celtic. Conceded by Cameron Kerr. Corner, Celtic. Conceded by Paul McGowan. Substitution, Dundee. Gary Harkins replaces Rory Loy because of an injury. Substitution, Celtic. Charlie Mulgrew replaces Erik Sviatchenko because of an injury. Attempt missed. Greg Stewart (Dundee) right footed shot from the right side of the six yard box misses to the right.